Paul, sorry about the car issues. Did you replace the water pump? Some water pumps have different impellers that flow coolant at different rates. It's all based on the size of the water pump pulley. Anyway - that's just a thought. Here's an idea, and at least it's cheap: Check the TOTAL timing and at what RPM it is all in. Use a timing tape for the diameter balancer/damper you have. Report back. Good luck! Well it's been over a year since I last updated this thread so figured it might be time for an update. I took it to a shop and they tried 2 things for the overheating. First they trimmed some of the A/C condenser (I think that is the name) bracket that was covering part of the rad. Then they put a much richer carb on it and gave me back the car to drive for a bit. The engine temp never went over 200*F but I also couldn't pass a gas station and it was running very rich. Since then I've gone back to the 750 cfm Edelbrock and most of the time the temperature stays below 205, only going higher the odd time, still on the highway though. Going to need to play again next summer. 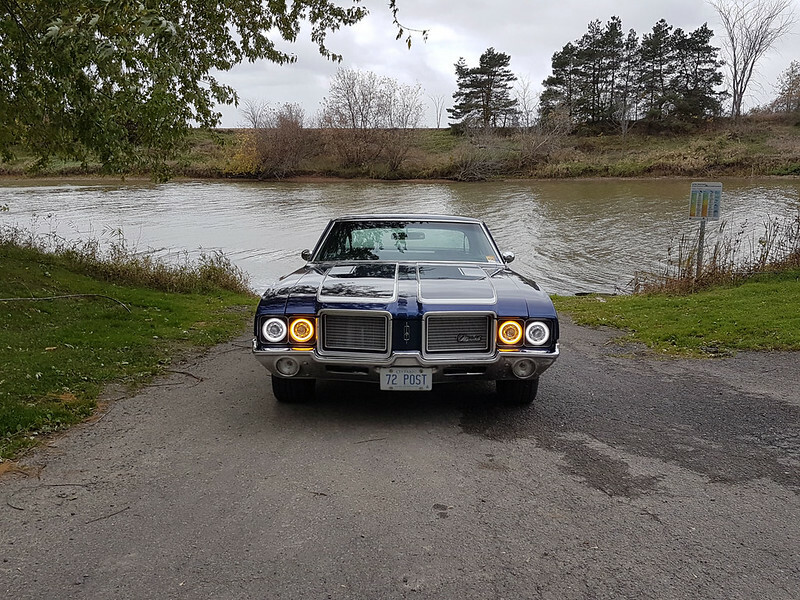 I replaced the first set of aftermarket gauges that were "universal" and needed a custom plate to mount to with a set of Dakota Digital VHX for 1970-72 Cutlass'. Other than a lot of wiring, the installation was simple. All sensor are wired to a control box which then uses 2 network cables to the gauge assembly. 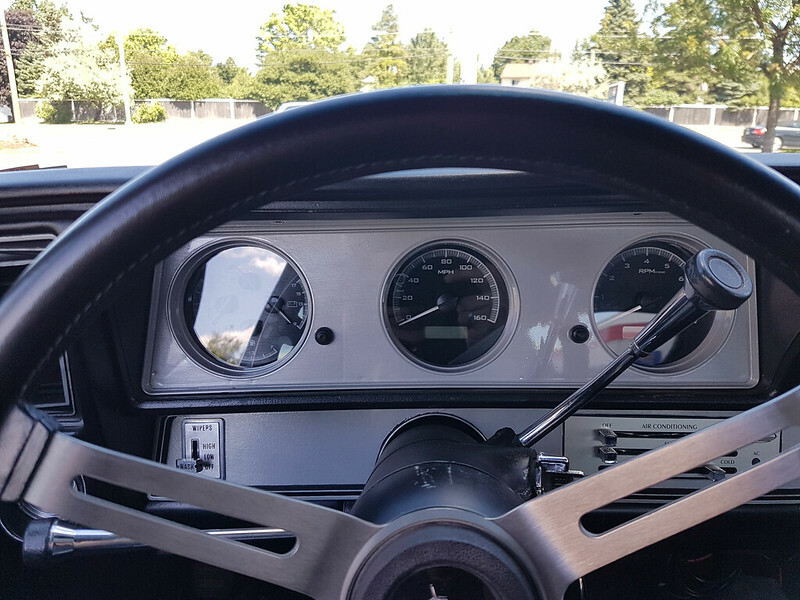 The gauge assembly mounts to the original mounting points in the dash and the original chrome/woodgrain trim panel fits over them. 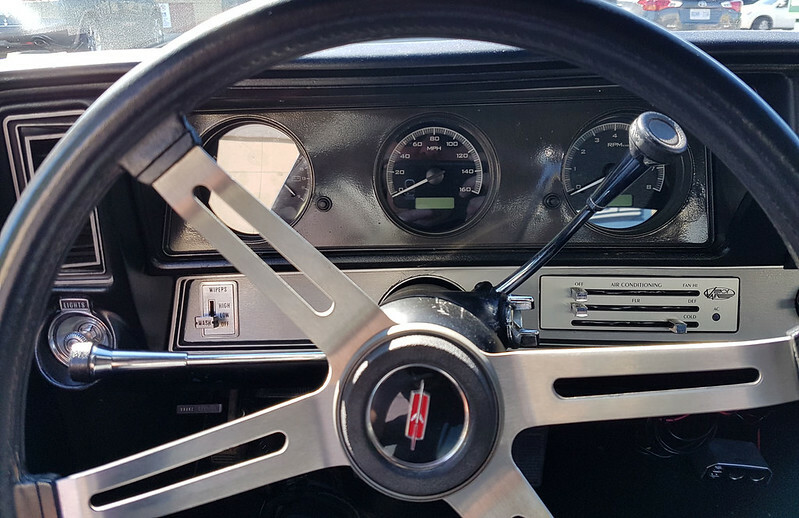 With this set of gauges and the last set which were also electric my speedometer is always bouncing around. Pulled the sensor off the transmission and attached a drill to it and it held a constant speed all the way up to 110mph which my car will never see! So looks like it is something in the transmission. The gauges are easy to read even at night. I've been having issues with the 4-wheel disk brakes this summer which re-adjusting the rear calipers seems to have mostly fixed. The only issue I'm still having is that sometimes the brake pedal doesn't quite return all the way. Sometimes I just need to pull it up slightly with my foot when leaving a stop. And the most recent issue is transmission related. When I am accelerating the rpms pick up a bit before the transmission shifts. When accelerating it doesn't seem to shift into third until I take my foot off the accelerator. I'm hoping it is the vacuum modulator. Now I did get to drive the car a bit this summer including to an out of town show and back home again! So it is improving, just more speedbumps along the way. Very cool gauges! I like them a lot. As far as the speedo bouncing around is concerned, I'd call Dakota Digital and see if they've got an easy fix. Bob, I did call Dakota Digital and they were the ones who recommended testing the electronic sensor with the drill to determine the source of the problem. I have a th-350 so I'll look into the link you posted. The transmission had been shifting fine for a couple of years (~ 5000 kms) then suddenly started acting up. I just read the whole thread! nice work!! Have you tried running a pusher fan setup on the front of the radiator. Also if you aren't running AC did you remove the condenser from in front of the Radiator? I was at nationals in Cincinnati. I had my 56 98 there. sorry I didn't see you there. Was it Tim Gettler that helped you? I used to belong to belong to the cincy chapter before I moved .I actually volunteered Thursday night at the main entrance to direct cars to registration! I am running the Vintage Air A/C system which moves the contents of the big box on the firewall to under the dash inside the car. With the car running warm I just haven't been able to use it much. I have not tried a pusher fan, but think that with the mild engine and gear I have I shouldn't need one. Yes, I think it was Tim Gettler who was helping me. So... time for an update? Unfortunately nothing good although nothing too bad either. Overheating: Unfortunately I did get to drive the car enough to see if it was still overheating or not since I was having (and still have) brake issues. 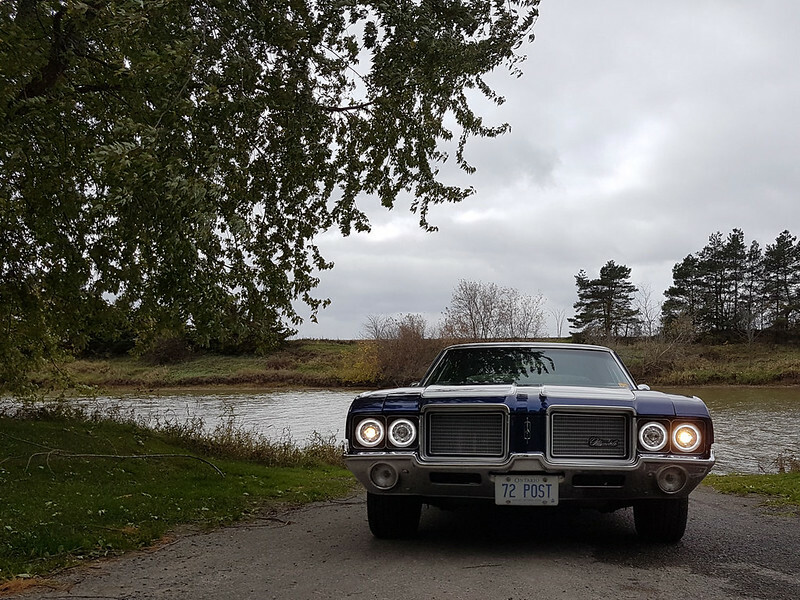 Brake issues: Since the 4-wheel disc brake conversion was installed the brake pedal doesn't always return all the way when I take my foot off when the car is stopped. When I am stopped and take my foot off the pedal the car does not roll until I stick my foot under the brake pedal and lift it up a little then the car starts to roll. I've adjusted the rear calipers and replaced the master cylinder and still no improvement. Anyone have any thoughts on the brake issue? And the most recent from last fall is a transmission issue. After adjusting the rear brake calipers I took it out for a test drive (with a friend into Mustangs of course!) and noticed it wasn't shifting properly. I took it to a transmission shop and after they test drove it they said it looks like it is not shifting into second, going directly from first to third. 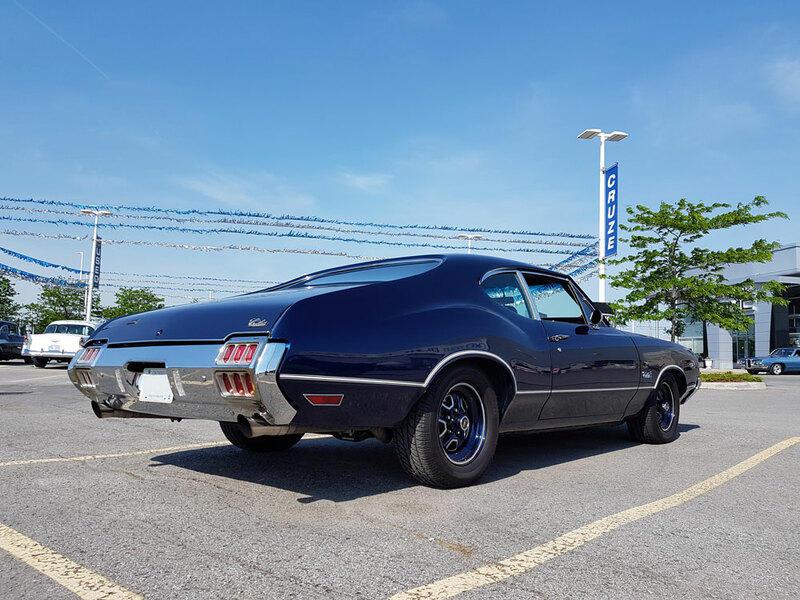 The Cutlass is still at the transmission shop. Right now I'm most confused by the brake issue. Once I get the car back from the transmission shop I'll look at the pedal itself to see if it might be binding on something. If not, I'm completely lost. I installed the same Right Stuff Brake system you did over the winter. Had the same issue with the rotors fitting over the axles as you did. Mine were pretty close so I ended up using a bench grinder on the outside of the hubs to slowly take some material off. I turned the hubs slowly as they were grinding to try to make it even. It worked out good and they fit fine now. They give you a couple spacers for the rear caliper bracket, but I ended up not needing any of them. Even the thinnest one was off a bit. I also had to install longer wheel studs because the lug nuts only grabbed a couple threads with my aftermarket wheels. 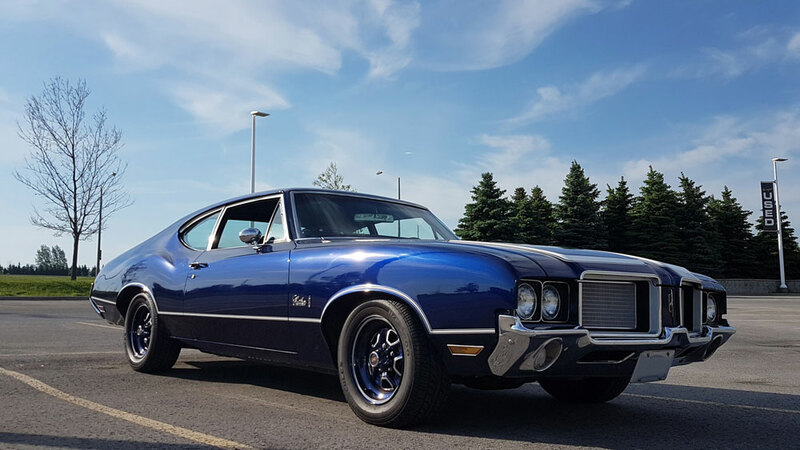 Did you get the whole SS brake line kit from them? I had a problem with the line that went from the proportion valve to the left side caliper. The one they gave me was actually bent the opposite direction that it needed to go. I called them up and they said that's what showed for GM A body. I ended up having to manually bend the line in the direction I needed it and sending it to them to make me a custom line. They didn't charge me for that and they got it to me pretty fast, so I can't complain. As far as your brake pedal issue, I've got to think it's something in the booster or the spring it the master cylinder. I know when I bench bleed my master cylinder, it was hard at first to push the plunger, then it like broke free and it was easy. Maybe your pin from the booster to the MC isn't adjusted correctly. Or the pedal rod. I was also having a problem with my engine running hot, so I recently installed a 4 core radiator from Autozone. I was thinking about going with an aluminum one, but the one from Autozone was $165 shipped. The cheapest aluminum one I seen was over $200. Anyway, I installed it and my engine runs below 180 now. I was up over 200. I drove it for a good hour and a half the over day when it was around 84 outside. While sitting in some traffic, it went up to almost 190, but it cooled off to below 180 when I started moving again. I know you said you installed an aluminum radiator, but what size is it? 2 or 3 core? dfire, I've already replace the master cylinder and I am having the same issues. As for the brake booster, not sure how to test that other than replacing it at my cost. My kit was fine (as far as I know until we figure out the root of my brake issues). For my overheating issue, it runs hot at highway speeds but runs cool in-town. Time for an update but no pictures at the moment. By last fall most of the issues seem to have been resolved. The smoking gun for the brakes not releasing was... the new brake booster in the disc brake conversion kit. After replacing the master cylinder, adjusting the rear calipers and parking brake the problem was still there. After discussing the issue with the manufacturer of the disc brake conversion kit we agreed the only thing left was the brake booster. The Right Stuff has great customer service and sent me a new one. After installing it problem solved! With the overly generous carburetor the shop put on and the trimming of the A/C condensor bracket the overheating issue went away. After fixing the brakes I put the Performer 750 back on and it is still running well. Next step is to put the adjusted Quadrajet back on to see if I can increase my fuel economy a little. With these issues resolved and driving the car more, other problems started to pop up. One of the first things I did after getting the car was to install lowering springs. The ride was fine when it was still a SBO but when I swapped to the 455 I noticed it would scrape on rough roads or even highway expansion joints. It also didn't have a rear sway bar. I bought new springs and a rear sway bar from RideTech. I didn't gain any ride height from the new springs but it handles noticeably better. Now it seems to be scraping in and out of my garage but not on the road as much. I'll report back once I get more miles on the car and have some pictures. Sounds like a good news story Paul! Glad your demons are being vanquished. One or two are still lingering. 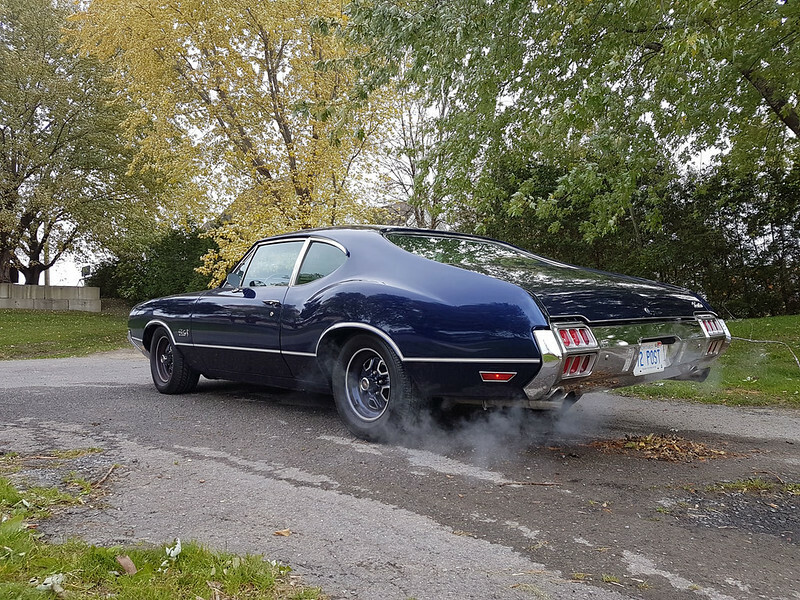 I was out at a car show today and the temps where into the 30's (Celcius) and humidex of near 40*C so decided to run the A/C on the way home. Water temp got up to about 210-215*F before I turned the A/C off. Dropped about 10*F in about 5 minutes on the highway. Looks like I'll need to take it for a long run on a hot day running the A/C and see what happens. I was happy to see it drop with the A/C off. I'll try to get some pics in a couple of days. Time for an update with pics! 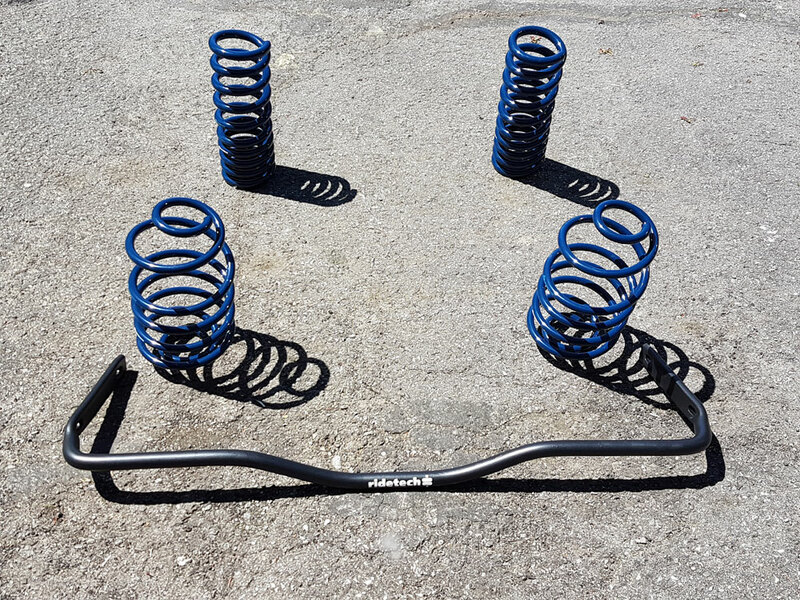 This was the spring project for this year: ridetech springs and rear sway bar. It's a shame the springs will be hidden, they match the paint. 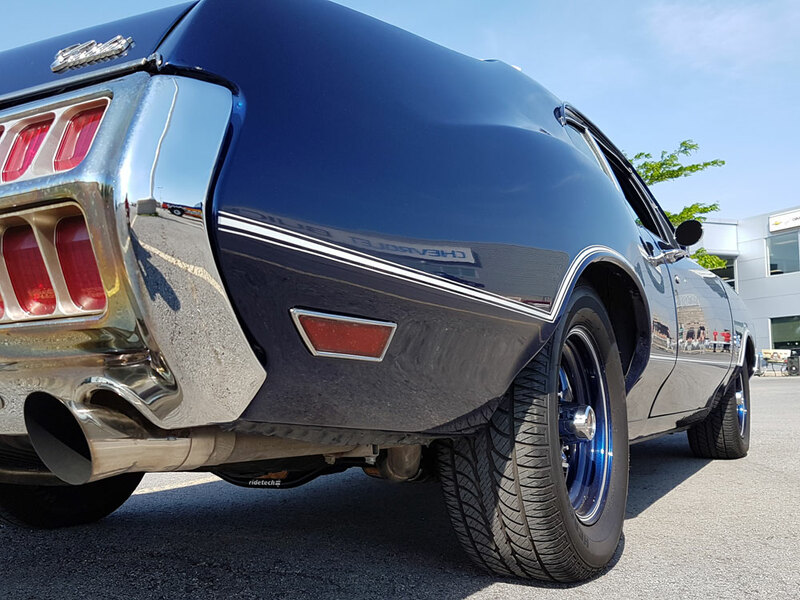 Since the Cutlass was already lowered, installing the ridetech springs did not make much of a change to the ride height. Handling on the other hand was a huge improvement. There are a few roundabouts nearby and on my first drive with the new suspension I took them a couple of times. Looks fantastic, and congrats on getting things ironed out! 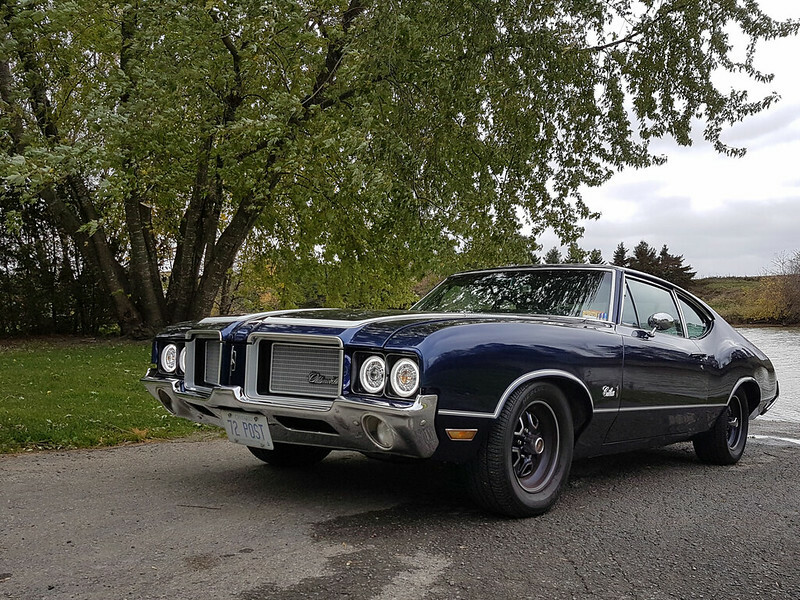 Just curious, you mentioned that the car was already lowered...with what, drop spindles, or just some different lowering springs? And...1" drop, 2", etc.? Thanks in advance! Just noticed your comment. The car was lowered with just springs originally. I do not know the exact amount though. They were Summit Racing brand lowering springs. 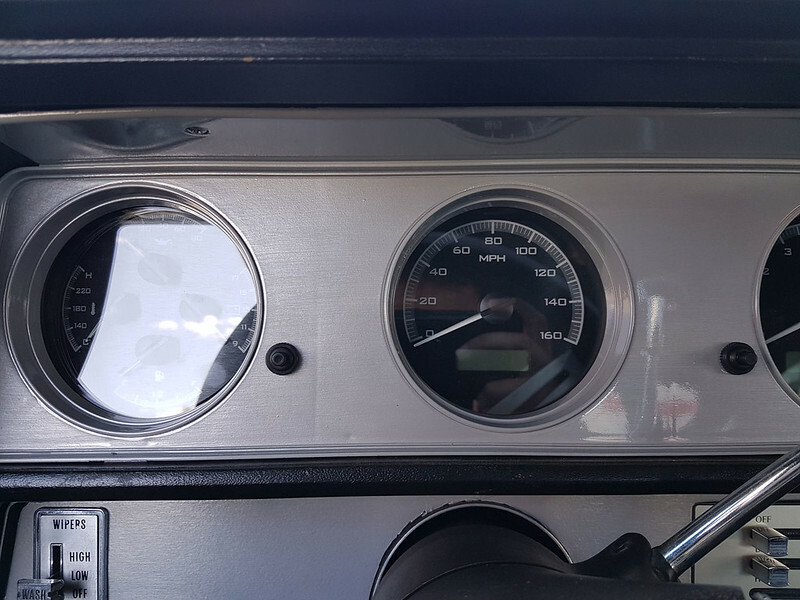 After going with the brushed aluminum interior trim and switching to the Dakota Digital gauges a few years ago, the gauge trim panel looked out of place. I just couldn't see myself cutting the perfect round openings needed to use the vinyl wrap I used on the dash and door panels. This summer I heard about a local shop doing hydrographics. I stopped to check it out and it looked like it would be perfect way to finish the trim panel. I'd say he got a pretty good match. The other mod was improved lighting. Saw these online last winter and really liked them the moment I saw them. 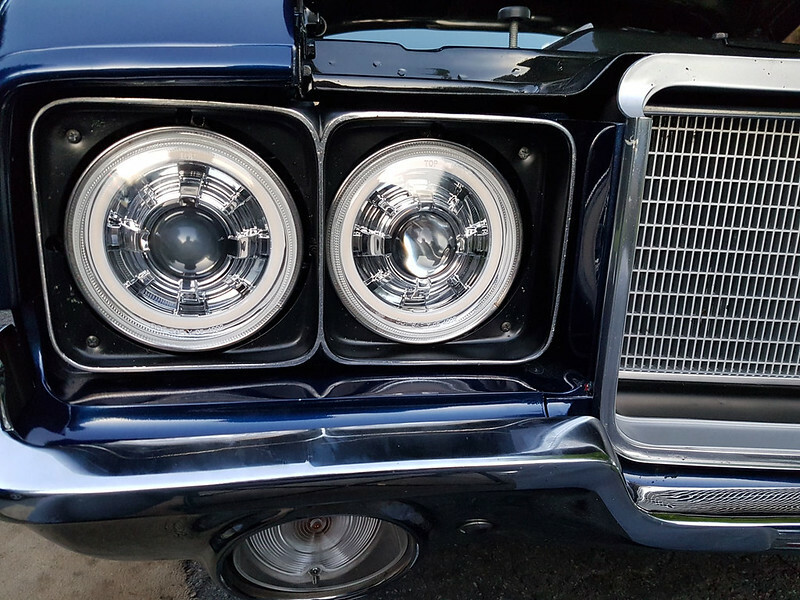 They are full projector headlights with switchback LED halos. All halos are used for daytime running lights/parking lights and I've also wired up the highbeam halos for the turn signals. I originally had all halos wired for signals and tried the low beam halos only but I just prefer the look this way. I've taken out the factory turn signal bulbs so that only the halos are my turn signals. Because of the missing turn signal bulbs, I've had to rewire the front side marker lights. Unfortunately they no longer flash but they still working as marker lights. Pretty cool with those yellow inners. I quess that in lightning up the road is also some difference with projectors, if they are good. Really good looking car anyways, those black rims are nice touch. "Holiday Coupe" vs "Sports Coupe"